BenedictusdeSpinoza is a Legacy Library. Legacy libraries are the personal libraries of famous readers, entered by LibraryThing members from the Legacy Libraries group. » Benedictus de Spinoza's catalog. » Benedictus de Spinoza's legacy profile. BenedictusdeSpinoza is also an author. 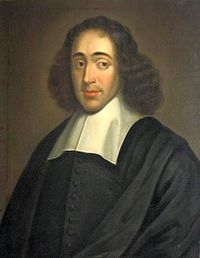 » See Benedictus de Spinoza's author page. About meBaruch Spinoza (later Benedictus de Spinoza), 24 November 1632 - 21 February 1677; Jewish-Dutch rationalist philosopher and lens grinder. Born in Amsterdam to a family of transplanted Portuguese Sephardic Jews, Spinoza was educated at the Keter Torah yeshiva of the Amsterdam Talmud Torah congregation, where his teachers included Manasseh ben Israel (a friend of Grotius and Vossius). He later studied with Franciscus van den Enden and taught at the latter's school. Following the death of his father in 1654 Spinoza and his brother ran the family's importing business for a time. In 1656 he was excommunicated from the Jewish community for "abominable heresies" and "evil opinions and acts." Spinoza had begun advocating theological/philosophical views radical for the time. Spinoza left Amsterdam around 1660-1661 and moved to Rijnsburg, where he began work on his major philosophical texts. He returned to Amsterdam in 1663 before moving to Voorburg the same year. He continued work on his philosophical writings, and also was involved in optical experiments with Christiaan Huygens and others. In 1670 he removed to The Hague, where he remained for the rest of his life. Spinoza's native tongue was Spanish, but he learned Hebrew, Portuguese, Dutch, Latin, and perhaps French. About my libraryA list of the books in Spinoza's library is included in the "Inventaire des biens et meubles délaissés par feu le Seigneur Bénédict de Spinoza né à Amsterdam, décédé le 21 février 1677 à la maison du Sr. Spyck, résidant à La Haye, le tout conforme à ce qui se trouvait à la maison dudit Sr. Spyck." Also see some of the other sources notes here. Note: Replacement copies of many Spinoza books were purchased around the turn of the twentieth century for display in the Spinozahuis museum in Rijnsburg. The editions selected for this reconstruction were based on editions Spinoza might have owned, but the specific editions he owned are, in many cases, unknown.